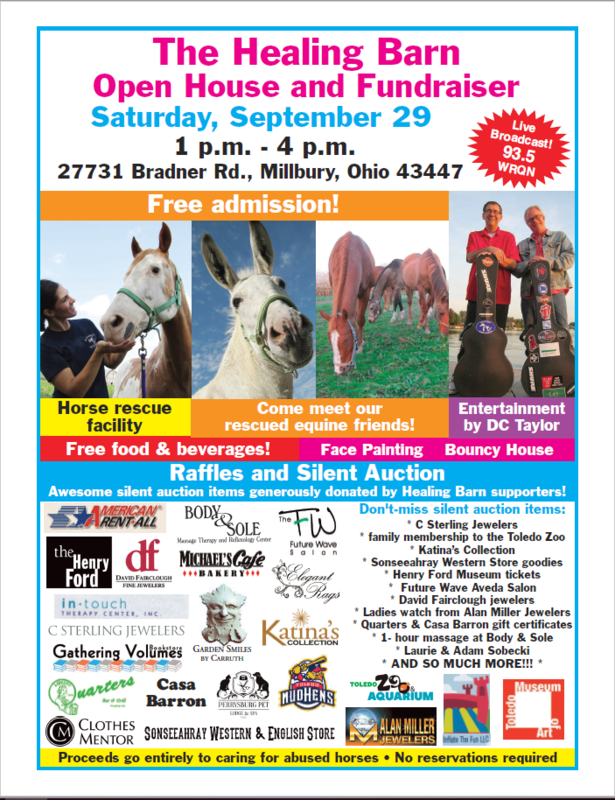 The Healing Barn 8th Annual Open House and Adoption Event: This fall we will be hosting our 8th annual open house & fundraiser. We welcome our friends, family and community to visit our facility! Our event will be held Saturday September 29, 2018. The open house will feature a bouncy house, face painting, kids activities, live music, raffle ticket and silent auction prizes, food, refreshments and of course horses!!!! Come out and meet us, our rescue animals and possibly win some neat prizes! All proceeds raised and collected at this event will be directly donated back to our facility to help pay for our rescues daily needs, farrier bills and vet bills! If you have any questions about this event please contact Corri Swigart Mayo at 419-836-8367 or email her at corri@thehealingbarn.com! We look forward to seeing you on September 29, 2018!! Due to other commitments I can’t make it. No worries we understand life is busy. Please consider donating to our cause using our non- profits PayPal donation link below! What are the hours of the open house on September 29th?